The classic flavouring for burnt cream (A.K.A. 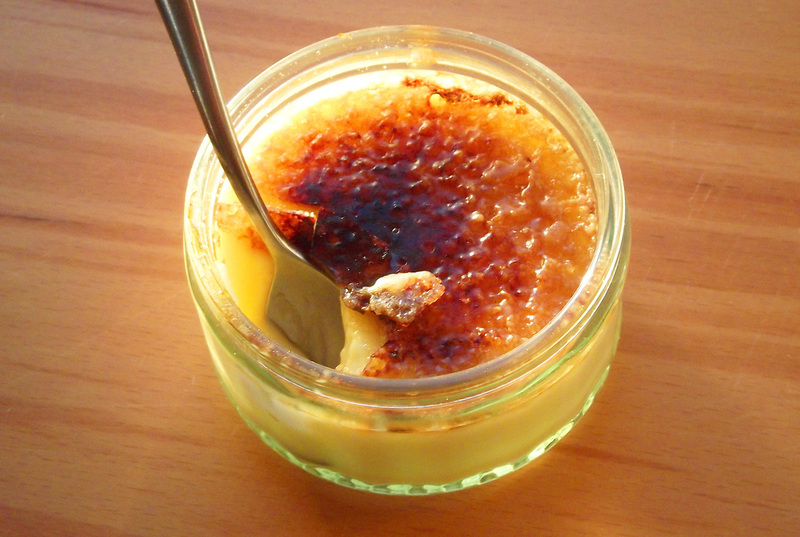 crème brûlée) is vanilla - add the seeds and the pod to the cream as it heats - but I didn't have any. I've always got a bottle of elderflower cordial though (Bottle Green ideally), and I now think I prefer it to vanilla for this - it adds a delicate, fresh note to the burnt cream. Heat your oven to 150C/130C fan. In a bowl, whisk the egg yolks and caster sugar together. In a small pan, heat the cream, milk and cordial, stirring the while, until just about to simmer. Remove from the heat and pour into the egg/sugar, whisking all the time. Place four ramekins in a roasting tray and pour the custard into them. Open the oven door, slide the tray onto the middle shelf, and then pour cold water into the tray until it comes about halfway up the sides of the ramekins. Close the oven door and bake for 40 minutes. Remove from the oven and allow to cool completely, then chill in the fridge for an hour or so. When you are ready to serve them, heat your grill to blistering hot, sprinkle the tops with the demerara sugar and slide the ramekins under the grill for a minute or so. Keep watching and remove the moment the tops are nicely golden and blistered (even better, if you have one, use a blow torch). Allow time for them to cool (and the burnt sugar to form a brittle shell) before scoffing.